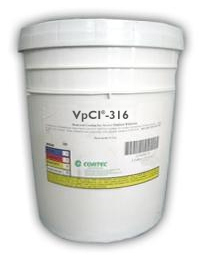 VpCI-316 is a corrosion inhibitor that is completely soluble in water. VpCI-316 produces a very thin, transparent, tack-free film on the metal surface. The film produced is a unique synthetic lubricant which provides resistance to scratching and mechanical damage of finely machined parts. It is non-toxic, environmentally friendly and does not contain nitrite or phosphate inhibitors. VpCI-316 also provides sufficient lubrication for stamping and cutting processes. VpCI-316 is supplied in concentrate form and is effective in a variety of dilutions from 2-30% in water. This wide dilution range allows VpCI-316 to provide excellent Vapor phase Corrosion protection for 1 to 24 months in the most economical way for a variety of applications. In addition, VpCI-316 can help reduce or eliminate shipping, warehousing, disposal and removal expenses. In most applications, VpCI-316 will not need to be removed prior to welding or further processing. The most unique property of VpCI-316 is that it contains Vapor phase Corrosion Inhibitors (VpCI) capable of protecting uncoated and unreachable surfaces such as stacks, coils, bundles, or packages. Use VpCI-316 after pickling, temper rolling or prior to shipping in place of slushing oils. VpCI-316 is ideal for protection of coils and sheets for customers requiring "dry" or uncoiled copper or brass. Any metal part, component, or assembly, between processing steps or in storage/transfer, can be protected without the health, fire, or disposal hazards of oils or phosphate coatings. Uses vary from miniature bearings, brass cartridges or metal furniture to larger earth-moving or agricultural machinery. VpCI-316 is ideally suited for indoor protection of metals subject to handling and assembly where dry-to-touch film quality, ease of removal and plant cleanliness are important requirements. Use a small percentage of VpCI-316 to ensure protection during storage/shipping without expensive drying, nitrogen blanketing, desiccants or heaters. Any covered or packaged product can be protected effectively and economically. The product appearance is improved rather than degraded, and customer acceptance is excellent, since no degreasing is required. Products arrive rust-free and ready-to-use. Service requirements due to corrosion are diminished, resulting in significant savings for the manufacturer. Available in 5 gallon plastic containers (Cortec Product # 12000025) or 55 gallon metal drums (Cortec Product # 12000026). 5 gallon drum weighs 50 pounds and ships under our standard shipping rates. The 55 gallon drum must be shipped by truck. We will provide you with a freight quote before we ship this product. The product should be stored sealed in a heated warehouse to avoid freezing. VpCI-316 has a shelf life of up to 24 months.